At Mobile World Congress in Barcelona today, LG Electronics revealed the company’s successor to the flagship G4 phone, aptly named the G5. The new G5 features a super-slim aluminum alloy unibody design that is a departure from the G4, but in line with the Samsung Galaxy phones and Apple's iPhones. However, in the case of the G5, the unibody appearance hides a secret—it is, in fact, an innovative modular construction, with various components that can be swapped in our out based on your needs. Slide off the bottom of the device and you can swap in a new 2800 mAh battery or pop on one of the phone’s companion modular accessories, which include the Hi-Fi Plus DAC (digital to audio converter) for better sound quality for corded headphones and a camera module that provides a larger grip, a physical shutter button and jog dial for zooming, as well as an additional 1200mAh battery. The phone will also allow you to expand the memory with a microSD card slot. 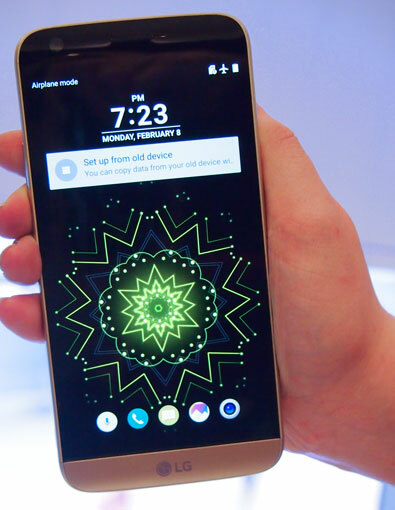 The customization makes LG’s G5 standout in a mobile market that’s pretty saturated with similar devices, and the company is showing a lot of ingenuity with the mobile accessories it will be releasing alongside the phone. LG is really stressing the video and camera capabilities of the G5. On the back of the phone, there are two lenses—one 16 MP that spans 78 degrees and one 8 MP wide angle lens that spans 135 degrees. The LG G5 automatically shifts between the lenses as you zoom to give you the best image. LG has also downsized the display of the G5 to 5.3 inches from 5.5 inches, more clearly separating it from the phablets on the market. And while the leather backs of the G4 are gone, you'll be able to choose from four colors, gray, rose gold, gold and white. The G5 has a Snapdragon 820 processor with 4 GB RAM and comes loaded with the Android Marshmallow operating system. And instead of having to wake up your phone to see notifications, the G5 features an always-on, low-energy lock screen that shows you all the info you might need at a glance. If that’s not enough camera excitement from Mobile World Congress. LG also revealed a standalone 360-degree camera that shoots both photos and videos and can store media on a microSD card or right onto your G5 via Bluetooth. But you’ll need something to watch that content, and that’s where LG’s newly announced VR headset comes in. LG’s viewer is super-light because your phone doesn't go into the gear—it’s tethered to the device with a USB-C cable. Plus, the VR viewer will work with any device that has at least a Snapdragon 820 processor and a USB-C port, making LG’s headset device agnostic. 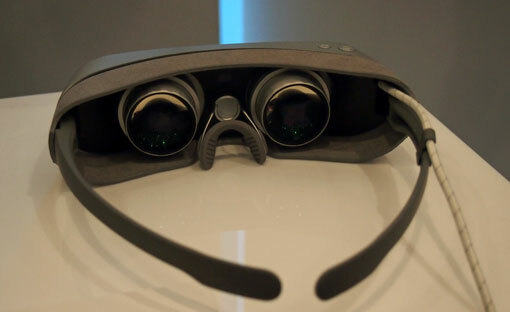 You can even watch 3D or high definition videos with it, so it has more functionality than a strict VR-only viewer. LG G5- the DLC edition.